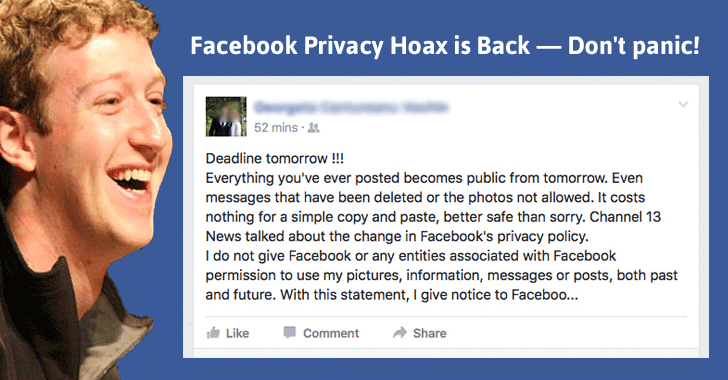 Home Others Facebook is Going to make all your Private Photos Public Tomorrow — It’s a Hoax! Facebook is Going to make all your Private Photos Public Tomorrow — It’s a Hoax! Don’t believe everything you read on Facebook. Despite so many awareness about Facebook hoaxes, online users fall for them and make them viral. One such viral post is circulating on Facebook that suggests everything that you have ever posted on the social media platform will become public tomorrow. Don’t worry — it’s a hoax. Yes, it’s still a hoax. Let me tell you one thing: the social media giant has made no such announcement; rather it has been made by one of you and people are spreading this all over Facebook. Similar Facebook privacy notice hoax was circulated on the social network a few months back, and it’s making the rounds again. If you are concerned about your privacy on Facebook, the company provides settings that limit strangers, and of course the company itself, from accessing your posts, photos or content. Go to the top-right corner of your Facebook timeline, click on the lock icon and run a Privacy Check for your Facebook profile. This will allow you to limit the audience for posts on Facebook and decide what information you want to share on your profile.